Today at the BETT Show I stumbled upon a start-up company called Moki. 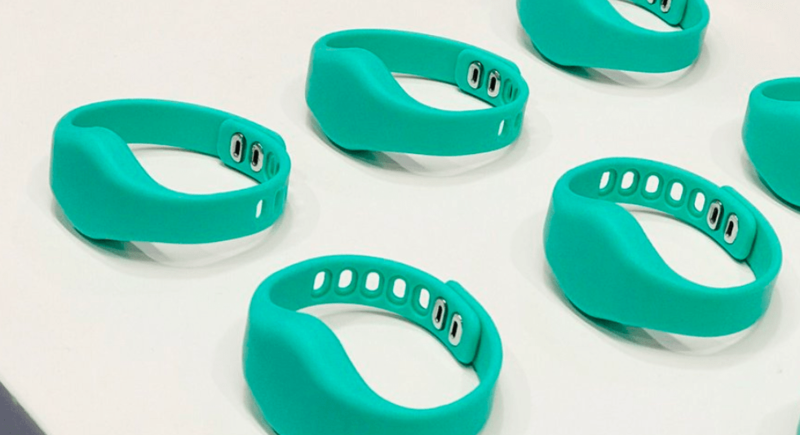 Moki is producing a fitness tracker that is designed for student use. At first glance you might think that it is just a colorful Fitbit, but it’s quite different from a Fitbit and similar fitness tracker bands. There are some key differences in the technology between Moki and Fitbit. But the biggest difference between Moki and Fitbit is in data collection and data use. Moki looks like a kids version of Fitbit or Garmin activity tracker because of the band design, but that’s about where the similarities end. Moki doesn’t use Bluetooth to sync data between the wrist band and a computer or phone. Instead of Bluetooth Moki uses a wireless data transfer like that found in popular contactless payment systems like is found in some gift cards and in Oyster cards. At the beginning of the day students tap their Moki bands against a data reader that is connected to your computer. Then at the end of the day students tap the reader again to sync their day’s data to your computer. As a teacher you can see all of the day’s data in one screen. Over time you can see weekly and monthly data reports too. As a product designed for school Moki has made data privacy its first concern. To that end the Moki bands only record movement and not heartbeats or any other data that is typically collected in activity trackers and smart watches made for adults. Data that you collect via Moki is stored on your computer, not on Moki’s platform. The only data that Moki does collect is anonymized information about the number of students you have and generalized patterns. In other words Moki doesn’t know which student is which and what they do individually. You’re the only one who has access to individualized data and that is done through your computer. The obvious use for Moki is simple tracking toward collective class goals like 100,000 steps in a day. You can also create small groups within your class to create group goals. A use for Moki that I didn’t think of, but was shared with me by one of Moki’s founders, is to use the data collected through Moki to optimize room change schedules between classes in day. By optimizing those schedules schools are able to help students get in a little bit more activity in a day. I asked about general availability of Moki. Unfortunately, it’s only available through Moki itself right now as it is still in a beta period. They are signing-up schools for participation right now. If you’re interested in trying Moki in your school, get in touch with them.